FAYETTEVILLE — Sydney Wilson ran a 21:35.74 to lead all Bryant Lady Hornets runners at the annual Chile Pepper Cross Country Festival at Agri Park. In a massive field of 700 runners and 86 teams from several states, Wilson finished 240th overall and 42nd among Arkansas runners. 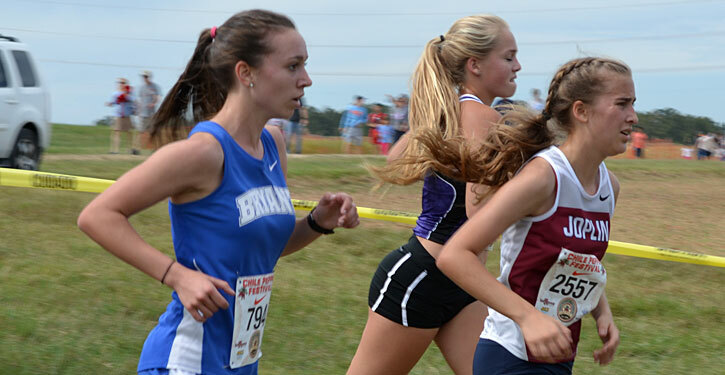 In the junior girls competition, Olivia Orr paced the Bryant contingent, finishing 54th overall in a time of 22:05.39. Bailey Brazil was the second runner for the Bryant varsity, running a 21:49.97 to place 262nd. Bree Hood turned in a 21:58.70 and Lauren Hart finished in 23:07.95. Zhania Hall completed the team’s scoring quintet in a time of 23:41.10. In addition, Natashia Hobby ran a 24:28.39 and Sarah Rogers turned in a 24:40.32. For the junior girls, stepping up to the 5K distance, Jilliam Colclassure was 72nd in a field of 656 runners and 54 teams with a time of 23:06.22. Maddie Gallagher was 98th in 23:36.14. Madison Moore’s 24:37.25 and Sydney Dettmer’s 24:41.84. Ellie O’Gary finished in 25:17.30 and Caleigh Martin was right with her at 25:19.79 to round out the top seven. Madison Dettmer ran a 25:42.57 with Rachel Buck finishing in 25:45.41, Jimena Guitar at 26:12.65 and Mika Johnson 28:11.37. “I’m always interested to see how the girls transfer from the 2 mile race (like they do all season) to this 5K,” Dale said. “One extra mile doesn’t appear like much, but it truly make a big difference. Olivia Orr did an excellent job of stepping up and being the leader in this race for the Junior Lady Hornets. Up next is the lone home meet of the season, the Bryant Invitational on Saturday, Oct. 8, at Bishop Park.